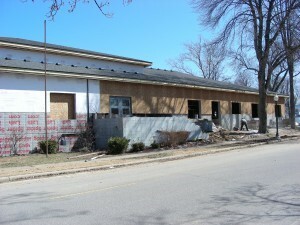 Work continues on the Hub at the Winona Lake, Ind., Grace Brethren Church. The Grace Brethren Investment Foundation (GBIF) is providing the financing necessary for the Winona Lake, Ind., Grace Brethren Church to complete a new building project called the “Hub.” The church’s strategic plan is to retrofit, remodel, and expand an existing building known as the Youth Center to a multi-functional facility to be called the “The Hub.” The facility will serve as a multi-use hub for training and development for students, for college-age young adults, and for community groups. The expansion will include new bathrooms, a classroom-capable gathering area, and a multi-use courtyard/lobby. The retrofit will ensure that people of all ages, both from the church and from the community, can benefit from this multi-use facility. The church has received faith commitment promises from the congregation of around $1 million over three years and in excess of $300,000 has already been contributed. The total project cost is approximately $1.3 million. The goal is to wind-up with a low long-term mortgage amount. “Once again the GBIF is honored to assist Winona Lake in their latest step of faith. The “Hub” will most certainly be a tremendous new gathering area not only for youth, but for people of all ages and the community at large. We are excited to see how God will use the new facility.” said Ken Seyfert, executive director of operations for GBIF.